The Foodie Travel Guide goes on a delicious hunt for the best scones in London (someone has to do it). Ah, scones. These baked treats may originally hail from Scotland but scones are loved by Brits far and wide. They’re a tea time staple. In London’s luxury hotels, where tourists love to experience the full works of the traditional English afternoon tea, scones are guaranteed a place on the cake stand. And, for those living and working in the capital, a sit down with a nice cup of tea and a scone in a friendly neighbourhood café, is simply good for the soul. 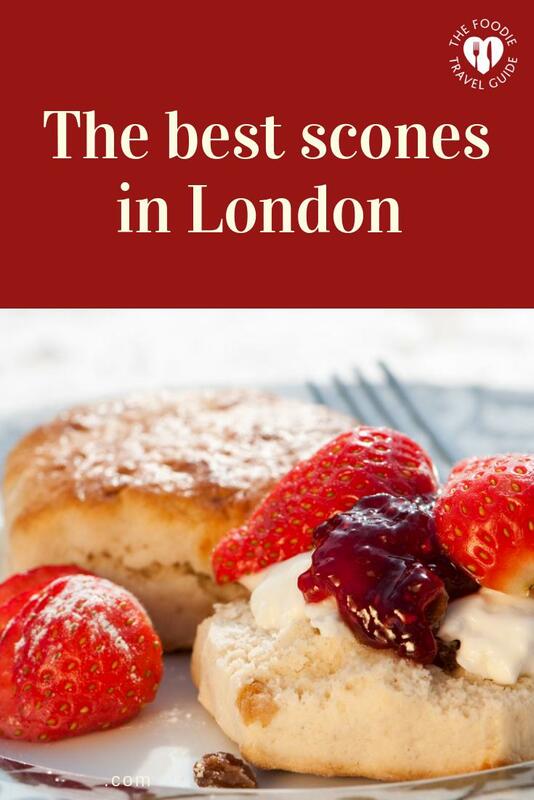 No wonder, then, that London has some of the best scones in the country. Interested? Look no further. Whether you like your scones for breakfast, lunch or tea – plain, sweet or savoury – I think you’ll love these delicious places to enjoy scones in the capital. These are my personal favourite. Gail’s Bakery has taken the humble scone and elevated it with modern and unique flavour combinations. Its sweet scones come with a crunchy, sugary coating. The blueberry, apricot and ginger scone is baked with generous chunks of fruit and ginger. Each delicious mouthful marries the sweetness of the fruit with the fiery kick of the ginger. The sour cherry and dark chocolate scone is very hygge. It would make a cosy partner to a warming mug of hot cocoa on a chilly winter’s day (or even a glass of red wine by the fireside). The maple and pecan scone calls for a strong morning coffee and the Sunday papers. While it’s still hot from the oven, the scone is drizzled with a maple glaze and sprinkled with toasted pecans. If you prefer savoury scones to sweet, try the melt-in-your-mouth buttery cheese and chive scone. For a light supper, warm it in the oven and serve with a bowl of creamy smoked haddock chowder and a chunk of mature Cheddar cheese. Foodie Travel Guide Tip: Gail’s Bakery has locations in London, St Albans, Brighton and Oxford. If you live outside London, you can order Gail’s scones online. Alternatively, make your own at home using the recipes in the Gail’s Bakery Cookbook. At Fortnum & Mason in London’s Piccadilly, thousands of scones are freshly baked each day. The royal grocer has been baking them to its ‘secret’ recipe for decades. Fortnum’s famous scones are served with clotted cream, strawberry preserve and lemon curd. Hosted in the elegant Diamond Jubilee Salon, afternoon tea at Fortnum & Mason really is something to celebrate. The salon with its eau-de-nil tea service, colourful artwork and grand piano, was formally opened by the Queen in 2012. You’ll find both plain and fruit scones are on the Fortnum’s afternoon tea menu. For those with special dietary requirements, the gluten-free scones are some of the best in London (Fortnum’s offers gluten-free, dairy-free and vegan versions of its afternoon tea menu). Foodie Travel Guide Tip: The once secret scone recipe is now published in the Fortnum & Mason Cookbook by Tom Parker-Bowles. The book includes a recipe for its Stilton and blueberry scones. Other strong contenders for a luxury afternoon tea in Mayfair include The Ritz, Browns Hotel and Claridges. Walk past the Coach & Horses pub in London’s Soho and you’d be forgiven for not knowing there’s a secret tearoom upstairs. If you love vintage décor and 50’s swing music, this is a quirky place to come with friends. Scones can be enjoyed here as part of the very reasonably priced traditional afternoon tea (£23) or a cream tea (£10). Take BB Bakery’s Afternoon Tea Bus Tour of London and you can eat scones and sip tea while viewing London’s best tourist sights. The old Routemaster bus takes you on a journey past London top landmarks including Big Ben, the Royal Albert Hall and Buckingham Palace. Foodie Travel Guide Tip: Tours leave several times a day from London’s Victoria coach station. You can book tickets here. Other contenders for afternoon tea with a view include The Shard, London’s tallest building and Rabot 1745, Hotel Chocolat’s restaurant at Borough Market which has a terrace overlooking the food market. As part of their chocolate afternoon tea, scones are served with little pots of cocoa nib butter. The beautiful Orangery in Kensington Palace Gardens was built for Queen Anne. If you’ve seen the film The Favourite, you’ll already know a little about her life. The Orangery was where she grew her citrus trees and hosted lavish parties. She also loved to sit on the terrace and admire her beautiful garden. The building is currently undergoing renovation work so afternoon tea is now served in a temporary pavilion. The scones however, still commemorate Queen Anne and are baked with orange zest and currants. They are served with clotted cream and Wilkin & Sons Tiptree jam that’s made in Essex. Foodie Travel Guide Tip: You’ll find the recipe for orange-scented currant scones in the book ‘Tea Fit For a Queen’ written by Royal historian, Lucy Worsley. Regular size scones can be quite filling especially when served as part of an extravagant afternoon tea experience. Baby scones are often more welcome. After two tasty bites they’re gone, leaving more room for pretty cakes or perhaps a second order of finger sandwiches. The Victorian afternoon menu tea at the Victoria and Albert Museum features delicious mini scones. 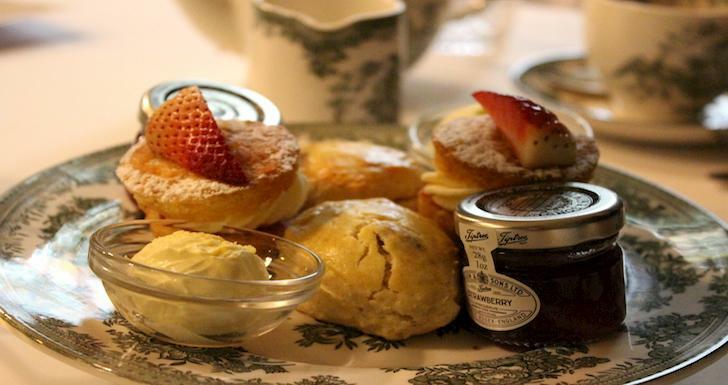 The afternoon tea includes finger sandwiches and cakes that are typical of the Victorian era. Served in the ornate William Morris room it is one of London’s unique afternoon teas. Daylesford Organic Farm in The Cotswolds now has four London cafes. They’re located in Pimlico, Marylebone, Brompton Cross and Notting Hill. Daylesford bakes its own organic scones and serves them with jam and cream. Why not pop in for a scone with a pot of organic tea? The Darjeeling First Flush is made from fresh young leaves from India. Le Pain Quotidien has several cafes across London. It bakes a tasty Cheddar and mustard scone. Order one with a bowl of nourishing soup for a speedy lunch. For health enthusiasts, it also does a spelt and quinoa scone. Every Sunday, there’s a popular flower market at Columbia Road in London’s East End. 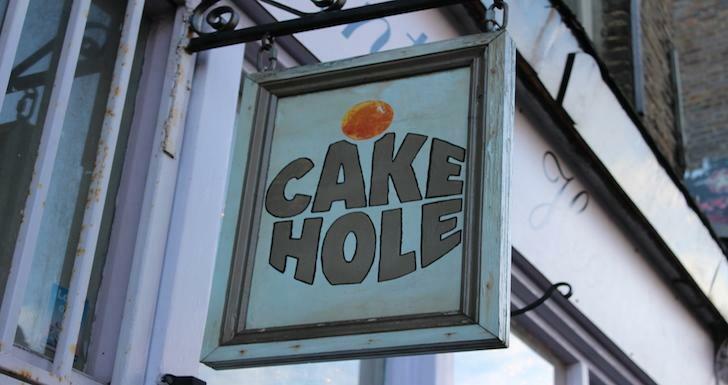 At one end, you’ll find the Cake Hole Cafe. At the front of the shop, there are shelves piled high with vintage crockery. Press pause from the crowds who flock to the market each week by stopping for a cuppa and a breakfast scone here. No booking required for this taste sensation in the City. The Modern Pantry in Clerkenwell is known for its unique twists on classics and inventive flavour combinations. For its drop-in cream tea, customers are served two different scones. There’s a tasty Cheddar, chive and garlic scone with a chive and poppyseed swirl and a delicious basil and black pepper scone with macerated blackberries and clotted cream. Foodie Travel Guide Tip: The Modern Pantry’s cream tea is served from Monday to Thursday from 8am until 5pm. It costs £18.50 and includes scones, tea, a slice of cake and a glass of Prosecco (or a white peach, lychee or passionfruit Bellini). Traditional afternoon tea for one is such a clever idea. Let’s hope it catches on in more afternoon tea venues across London. When Fortnum & Mason opened its new store at The Royal Exchange, it also opened the Fortnum & Mason bar and restaurant in the beautiful courtyard next door. If you’re in need of some me-time, it’s a lovely spot to sit, people watch and indulge in afternoon tea for one. Why not treat yourself? 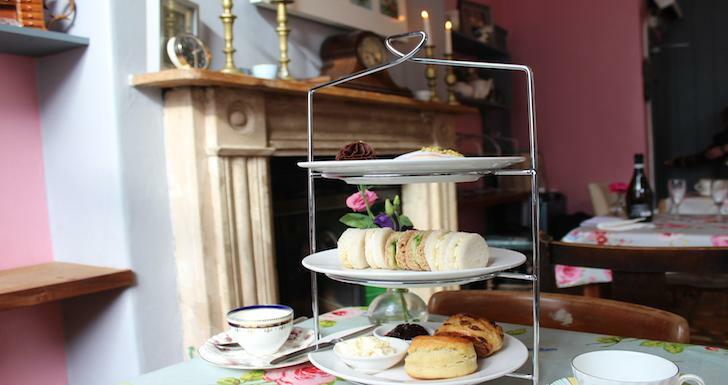 Foodie Travel Guide Tip: The Afternoon Tea for One menu includes tea, freshly-baked cakes, still-warm scones and elegant sandwiches all for £30 per person from Monday to Saturday from 3-4.30pm. Book a table here. The Bread Ahead stall at Borough Market in Southwark is a great place to buy scones. The company also has a bakery school located inside the market. There’s another one above the Bread Ahead café on Pavilion road in Chelsea (a very handy place if you like to shop along the King’s road). Foodie Travel Guide Tip: Take the English Baking Workshop course and one of the things you’ll learn is how to make scones. In 2017, the company also published its first cookbook – Baking School: The Bread Ahead Cookbook. If you’re unsure how to pronounce it, remember ‘It’s scone like gone, not scone like stone’. If you’re enjoying a scone as part of a cream tea, remember there are two hotly contested ways to correctly eat one. In Devon, they put cream on the bottom of the scone and jam on the top whereas in Cornwall, it’s the other way round.